I thought this month was a great box my favorite being the alila lipstick. It was all rounded catering for all body needs. Many people complained that the lipstick and foot cream where repetitions of past products but they where repetitions for the same brand but not the same products in the range like the lipstick last time was red and not bronze and the pedi-relax was the moisturizing cream and not the protection one. people also said that the bronze was not the correct shade for there lips but i thought it was great as it gives lips a warm look perfect for winter and it looks really dark in the container but when applied to lips it give a light shimmery look. The tan wipe i wouldn’t naturally use but it is something i would use for fun as the concept of these boxes is to try new things. Also the cards that it comes with every month has improved as they now provide you with information on where you can purchase these products which was a very nice touch. 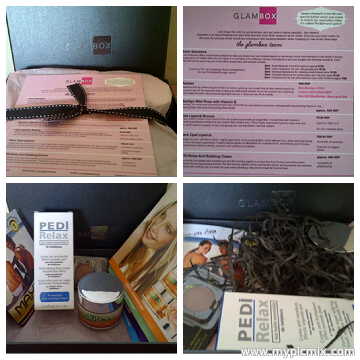 If you havent tried glambox i really recommend you do! this month we received 4 full size products which are valued way over the R100 you pay for subscription. I also really liked my box – but I do wish they’d add a few new brands. 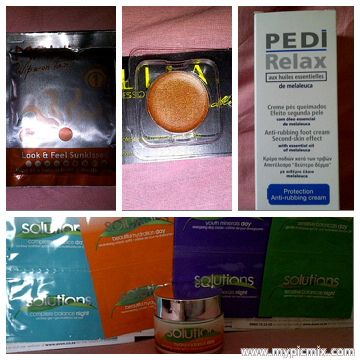 We’ve received lots of Avon and Pedi Relax goodies.